Home Products Inc.: The TCC Kitchen Center, A Modular Cooking Apparatus. The TCC Kitchen Center, A Modular Cooking Apparatus. I’m a big fan of all things modular, and while this isn’t technically being sold as such, if you think about it… it’s precisely that. The TCC Kitchen Center’s Power Base goes right on your kitchen counter. Within, you’ll find a robust 600W motor, with speeds going from 7,000 rpm to 18,000 rpm. Outside, you get a universal adaptor of sorts, on which you simply dock all sorts of kitchen appliances. Want a smoothie? 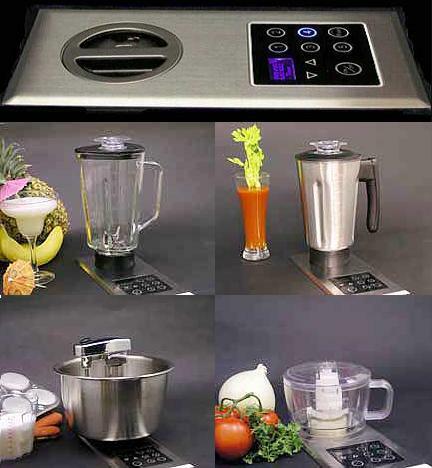 Take the blender “module” (minus the blender motor), place it on the Base, and blend away. Feel like mixing up a cake? Take the Stainless Mixer out (again, minus the mixer motor) and place it on the adaptor… Well, you get the idea. The advantage is that you can do away with electric cords, and redundant motors. Saves you space, a bit of time and some hassle. And what’s even better with all this is that it’s not actually that expensive. The Power Base will set you back $300, while the accessories range between $35 and $110.